Featuring… Michele Stodart, Charlie Dore, Celestine, Kate St John, Angela Gannon, Margo Buchanan, The Rosellas + Connie Chatwin. 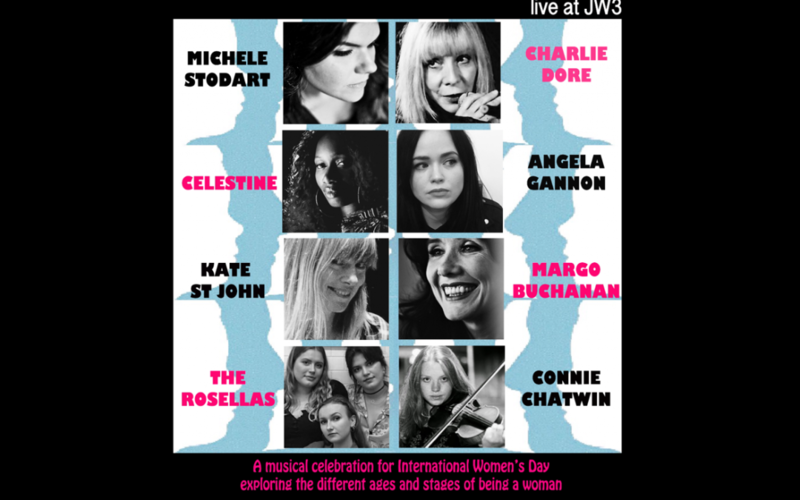 This special one-off concert is a musical celebration of all the ages and stages of being a woman, both in terms of the performers themselves and the thematic content of the songs. The night will include material by Joni Mitchell, Janis Ian, Fleetwood Mac, Martha Wainwright, Nina Simone, Brandi Carlyle, Dar Williams and much much more! Led by The Magic Numbers’ Michele Stodart, with a glorious array of artists. Part of JW3’s International Women’s Day Festival. NB: This event will take place in our alternative home for the evening: JW3 (341-351 Finchley Road, London NW3 6ET). Doors open 7.30, music starts 8pm. Michele Stodart is a solo artist as well as bassist, vocalist and co-songwriter with much loved, Mercury-Prize-nominated The Magic Numbers. The band recently released their fifth studio album, Outsiders, in May 2018 to great critical acclaim. In 2012, Michele self released an album of her own songs, Wide-Eyed Crossing, a southern drenched journey into Americana country blues. “I never thought I’d release a solo album, but I needed closure from those songs, so recording them was the only way to truly move on.” Michele continued writing, and started using her skills on bass, guitar and backing vocals, which led to many projects on stage and in the studio with artists including Kathryn Williams, David Ford, Ren Harvieu, David Kitt, O’Hooley & Tidow amongst many others. Michele later signed to none other than Bjork’s record label One Little Indian releasing her second solo album Pieces in 2016. She is set to record a new album this year. Charlie Dore is one of the UK’s most respected singer-songwriters. Her songs have won two Ascap awards, an Ivor Novello nomination, made UK No 1 and US No 4, while her 2017 album, Dark Matter won Best Album from the US Indie Acoustic Project. She has also worked as an actress in theatre, film & TV and co-founded London Comedy-Impro venue,The Hurricane Club. Her song Pilot of the Airwaves remains a radio favourite.While her own albums favour her more eclectic/roots leanings, she is one of a handful of UK writers to achieve success across many genres, defined by the range of artists to have recorded her songs, including Tina Turner, George Harrison, Celine Dion, Ricky Ross and Jimmy Nail. She is touring throughout 2019, but regularly writes for & with other artists and also enjoys mentoring emerging songwriters when she’s not touring. “An amazingly astute, moving and intelligent songwriter…a voice like Kate McGarrigle meets Dory Previn. Wonderful.” – Mike Harding. An eclectic soul artist with a velvet voice rich in emotion and experience. Bristol-based singer-songwriter, Celestine’s music fuses Soul, Funk, Gospel, Jazz/Blues with traditional African rhythms. Playful, sensual, bold and endearing, her passion and diverse musical ability transcends genres. She brings an honest, dynamic, and effervescent performance to the table, balancing nostalgia with modern, culture with fusion and all with prowess. Angela Gannon is best known as the vocalist/keyboard player of The Magic Numbers, where she sings/plays alongside Michele Stodart and both their brothers, Romeo Stodart and Sean Gannon. The band have a worldwide following and continue to tour internationally. They have supported such acts as Neil Young & Crazy Horse, Super Furry Animals, U2 and Brian Wilson. Angela’s voice can send a tingle down your spine as well as punch a hole straight through your heart, all in one breath. She started singing at the age of 12 at the encouragement of Michele and Romeo’s mum Juliet, but insisted she would do so only if the lights were off, in complete darkness. Angela is also a budding songwriter and has written the beautiful song ‘Black Rose’ on The Magic Numbers’ fourth album Alias. She also guest vocals with many live bands including Alan Tyler, Boxer Rebellion & Hanging Stars. Margo Buchanan was born in Lanark, Scotland and when she was twelve moved to Derby, England. She has lived in London since 1982.She left school and joined her first band at 16. She then moved to Coventry, where she was offered a job with the Specials if she dyed her hair blonde. She declined, and regretted it for years. She signed a record deal as a solo artist with MCA records and later London Records but didn’t enjoy the music she was asked to sing. She wasn’t writing original material at this point, and so she decided she’d better start writing. To support the learning curve, Margo put herself up for session work, which soon became a substantial part of her career and lasted a lot longer than she intended! She went on to record and perform with many artists, including Joni Mitchell, Eric Clapton, Billy Idol, Mark Knopfler, Pink Floyd, Seal, Tina Turner,Robert Plant, Paul Weller, Jo Cocker and many many more.She performed at both HM Queen Elizabeth’s Golden Jubilee Concert at Buckingham Palace and the Princess Diana Memorial Concert at Wembley Stadium. Kate St. John is a composer/arranger/singer and plays oboe, accordion, sax and piano. She was a member of The Dream Academy and has two solo albums. She has worked with many artists including Van Morrison, Laura Marling. Damon Albarn, Marianne Faithfull, Philip Glass and Tom Waits and has been Musical Director for many multi-artist shows. The Rosellas, previously known as the Three Little Birds, are an a-capella trio based in North London. Megan Bradbury, Mabel Hoskins and Sara-Lily Waite went to school together in Camden and began singing as a group in 2013. Since then they have performed at a number of events and venues in London, including Camden’s Green Note and the Islington Assembly Hall, opening for The Magic Numbers. The Rosellas write and perform their own acoustic arrangements of popular jazz and folk songs, producing a unique sound of pure, blended female vocals. Connie Chatwin is a versatile Violinist and Singer, based in London. She had classical training in Violin and also studied Jazz singing at Trinity Laban Conservatoire of Music and Dance, to which she joined with a full scholarship. She has decided to pursue a varied career ranging from classical orchestral playing and recording on jazz/hip hop/pop sessions, to touring with indie/rock bands. Playing for Sam Smith, Dodie, Dawn Penn, Pixie and the Gypsies and recording for James Arthur, Femi Temowo and Phoria amongst others, she has performed at many festivals and been on sessions at Abbey Road, Rak, Angel and other notable studios.